Qualified aftersales assistance, ready to offer a comprehensive range of services and accessories to make your Daily unique. An installment option that is convenient to start your work immediately. This is the range of Iveco Capital. It is the ideal solution for those who want to be owner of the vehicle immediately and intend to use it for a long period of time. The installment can cover up to 100% of the sale price of the vehicle. Deposits can be customized to adapt to the actual financial resources, the nature of its business and operating requirements of the vehicle. With so many different opportunities allows companies to use the Iveco vehicles necessary for their activities without the serious investment on their budget since the ownership of the vehicle remains the financial company in question property. The advantages for the companies, is that they can free up financial resources to devote to their core business. The payment can be customized to suit individual needs. Especially likened to Soft Leasing, a formula that facilitates the purchase with fees being much "lighter". Operating leases are a comprehensive product that allows the customer to use the vehicle and replace it at the end of the agreed period, from the start by defining the economic and financial commitment with a monthly fee in relation to the actual needs. No other commitments at the end of the lease and without affecting neither the company, nor the liquidity of bank credit lines. The ownership of the vehicle remains the finance company. An operating lease can be integrated with the choice of different services After-sale Iveco to better respond to customer needs. Iveco Capital services are available at all Iveco dealerships. 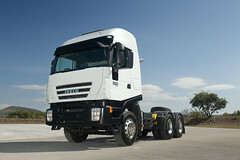 The approval is subject to the evaluation of the practice of Iveco Capital. The financial terms Possoni undergo adjustment due to changes in market interest rates. At the dealer network, members will find the offers valid for the current month (while supplies last). The first service that ensures your complete satisfaction. The service Iveco takes you mile after mile, is with the utmost expertise, professionalism and commitment. We know that is a job for you to travel, to play in the peace of mind and the security of always and immediately receive all necessary assistance is what Iveco is all about. By committing to respect the values ​​of the Iveco service, we want to ensure your complete satisfaction. 87 dealers with inventory parts, more than 700 authorized workshops distributed throughout the country. Your vehicle in good hands. Welcome to the world of accessories, Iveco Daily. A complete range of innovative products of the highest quality to meet your every desire are available. Easy and affordable products for everyone to customize your vehicle are available, adapting easily to specific job requirements. Thanks to the high standards of safety, convenience and comfort achieved by technological and stylistic research, Iveco's Accessories Line is able to make unique your Daily. Travel in total serenity with Iveco. Iveco has always been a leader in the world of transport. With reliability and excellence ensures maximum results in any work, thanks to the Origin 100 % Iveco parts, and expertise of its Service Network. A wide range of assistance programs individually designed to suit every need and keep in perfect form each vehicle. • Standard (full), which includes all the interventions of ordinary and extraordinary maintenance to total coverage of the vehicle. • Driveline which includes all routine maintenance more specific assistance for the powertrain. • Fast, this includes the only routine maintenance. 100% OF BENEFITS FOR YOU. 100% OF HEALTH FOR YOUR VEHICLE. You always want to travel in total serenity? As an alternative to maintenance contracts and repair, Iveco offers you the services extended warranty. You can be confident that your vehicle is repaired with the high professionalism that distinguishes the Iveco service network. Additionally, with the services extended warranty (which can affect Driveline or complete vehicle) you will be entitled to 24 hour rescue, with towing included on the whole national territory.